What if inflation really shows up, so plainly that even a central-bank chairman could no longer deny it? "By the time inflation becomes evident," reckons gold-heavy John Paulson, apparently writing to his hedge fund clients recently, "gold will probably have moved, which implies that now is the time to build a position." Paulson & Co. have good reason to study (and promote) how gold prices might move. Holding 4% of the giant $71 billion SPDR Gold Trust ETF sure concentrates the mind. 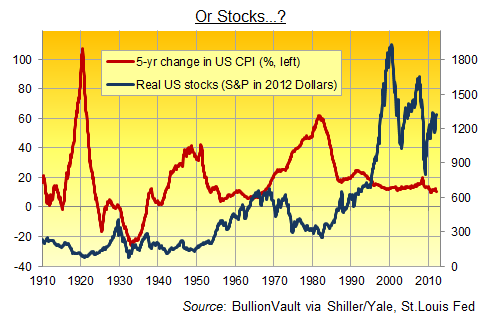 But the link between gold and inflation is exercising other finance professionals as well. Just like Paulson, Jeremy Grantham of GMO says inflation now looms. "The 800-pound gorilla...is not in the room yet, but you can hear him thumping his chest up in the hills," he writes in his latest client letter. This gorilla – a rising cost of living – would eat pensioners and bondholders for breakfast, of course, and gnaw on their fixed-income bones for lunch. "He will come eventually, and before he does, you should remember that stocks are underrated inflation hedges," the GMO letter goes on, pointing to scatter charts so dense you'd think Georges Seurat had painted them. 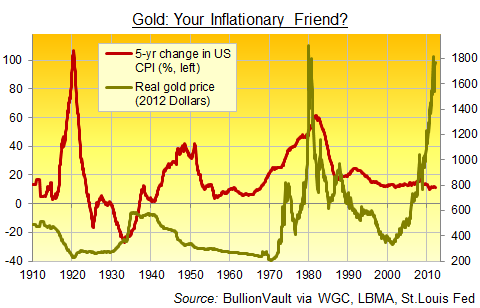 Beyond the pointilism, though, Grantham agrees with Paulson that you'll want to be early with gold. But stocks bought as an inflation hedge ahead of time could cost you at first. "As inflation picks up, the real price of gold goes up, the real price of bonds declines a lot, and equities decline also, but significantly less," says Grantham. Still, on a 10-year basis, no matter, he reckons. Such "surges in inflation have been a very slight issue for holders of equities (and gold)...but a very serious one for bondholders." And stocks remain "under-rated inflation hedges" he believes.